Le Bruant offers a breathtaking view of the beautiful bay and the St. Lawrence River. This cottage rental is located nearby to the village of Baie-Saint-Paul, where you will find restaurants, pubs, art galleries and just minutes away from Le Massif de Charlevoix Ski Resort or Casino of Charlevoix. It can accommodate sleeps up to four people. Whether you come during winter or summer, you will be charmed by this cozy cottage located in a peaceful setting, surrounded by nature. The wooded area, bordered by full grown hedges ensures privacy. As sole tenant of the cottage, your tranquillity is assured. In addition, the indoor and outdoor fireplaces, the barbecue and all the modern amenities will make your stay a dream come true. 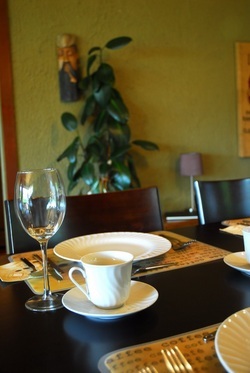 Le Bruant is a petfriendly cottage, so you can share good time with your favorite pet. Some amenities are provided for their confort.